Frittata is the omelette’s Italian cousin: just like the omelette, it can be a great vehicle for using up any leftovers you happen to have around (even cooked pasta! ), but it’s quicker and easier to make. It tastes great warm or cold, and once cut into wedges it is easily transportable, which is why in Italy it’s common to take a wedge to work for lunch. Of course it works just as well on your day off, whether you are having a picnic or hitting the beach. Frittatas are usually cooked on the stovetop, but if you dread the flip… feel free to bake yours in a regular oven! They are really quite foolproof, not to mention a quick, easy and inexpensive way to add some protein to any vegetables you have in your fridge and make them into a meal. 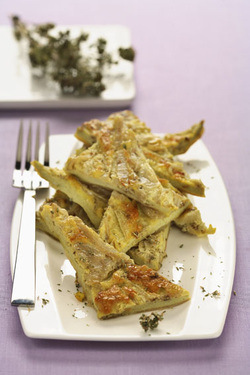 In Italy, we don’t usually serve frittatas for breakfast, but at either lunch or dinner. 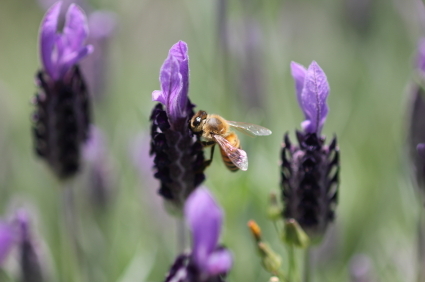 They can be a main course at a light meal, or an appetizer before several other courses. While Italians in general love this kind of food, Italian Jews are particularly fond of them because eggs are “parve”/ neutral, and can be consumed with either dairy or meat (incidentally, frittatas were probably introduced by the Jews exiled from Spain and Portugal, who also brought much more complex egg preparations, especially desserts). 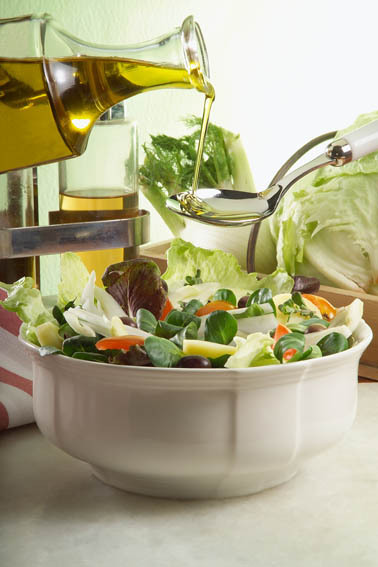 Such a traditional Italian recipe deserved an Italian color theme, which is why we are going with green, white and red. Slice the leek thinly. Seed the peppers and dice them, or cut them into thin strips. Seed the tomatoes and dice them (if using cherry tomatoes, cut them in half). Mince the parsley, discarding the stems. Heat the oil in a non-stick skillet. When the oil is hot, add the leeks and the peppers and saute’ until soft (about 3-4 minutes). In a bowl, slightly beat the eggs with 2 tbs of milk, salt and pepper. 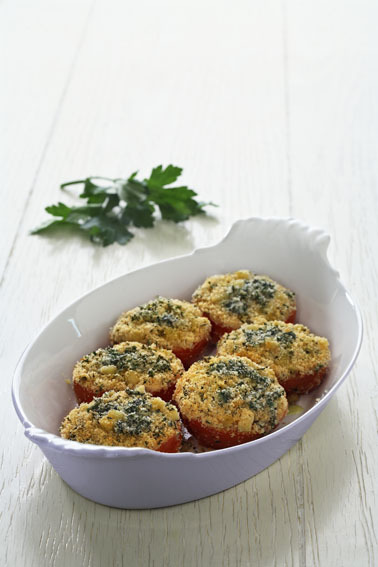 Combine with the diced tomatoes, the parsley, and the diced cheese. Pour the egg mixture into the skillet over the peppers. Allow thbottom of the frittata to cook, using a spatula to lift the sides to allow more liquid to run under. 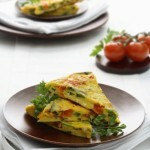 When the bottom is cooked, carefully flip the frittata with the help of a platter, and cook the other side. If using an oven-proof skillet, you can also transfer the pan into the oven and cook the top under the broiler for a few minutes, to avoid flipping. 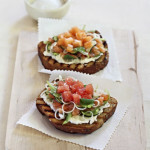 Bruschetta (which, by the way, should be pronounced [bru’sket:ta] ( listen) and not [bru’shet:ta], please!!!) is a snack that Italians have been enjoying for centuries. It’s a simple slice of roasted bread, rubbed with fresh garlic and topped with extra-virgin olive oil, salt and pepper, fresh tomato and basil. Tuscans, always the chic minimalists of Italy, skip the tomato and stick to olive oil and garlic; they call it Fettunta, “greased slice”. Of course they use the very first and very best oil of the season, which makes everything else seem redundant! 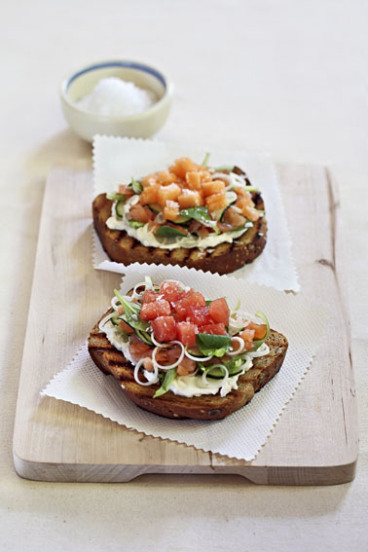 Just like bread soups or bread puddings, bruschetta was born as a way to salvage bread that was going stale (note to Americans: real bread does get stale! ), at a time when it was considered precious and nobody was watching their carbs and worrying about Atkins. Some Italian peasant, who never reached the fame of the Earl of Sandwich but remained nameless, had a culinary epiphany that would revolutionize the concept of snacking. 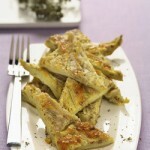 Rub the toasted or grilled bread slices with the garlic cloves while they are still hot. Discard the garlic. Brush with very little oil. Spread a little cheese on the slices. Dress the two melons (separately) with the rest of the oil, and little salt and pepper. If using feta, which is saltier, you can skip the salt. Top some slices with the cantaloupe and others with watermelon. Decorate with fresh mint. One of the most popular ways to serve this Siman (Symbol) in our Rosh HaShana Seder: inside an earthy frittata (with or without the addition of spinach). Frittatas can be prepared in advance. Preheat the broiler (if using). Heat the olive oil in a 10? nonstick skillet. Add the leeks, some salt, and cook on medium heat until tender, about 5 minutes. In the meantime, whisk the eggs with 1/2 teaspoon salt, a pinch of pepper (and nutmeg, if liked) in a bowl. Add egg mixture to the leeks in the skillet and fold gently to combine. Cook over medium heat until almost set. If you are brave, flip over with the help of a platter, and cook the other side. 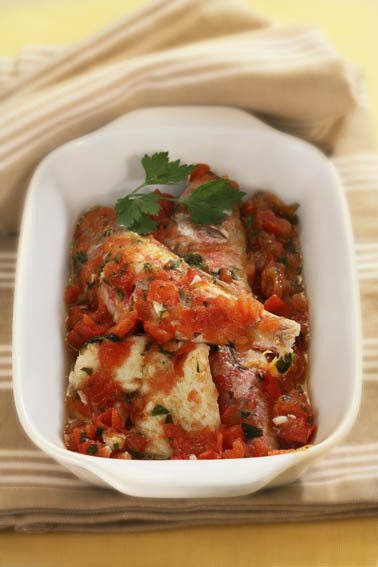 If you are unsure, transfer the skillet under your (preheated broiler for about 2-3 minutes. If you decide to use the broiler, make sure your skillet is oven-proof and doesn’t have a plastic handle. 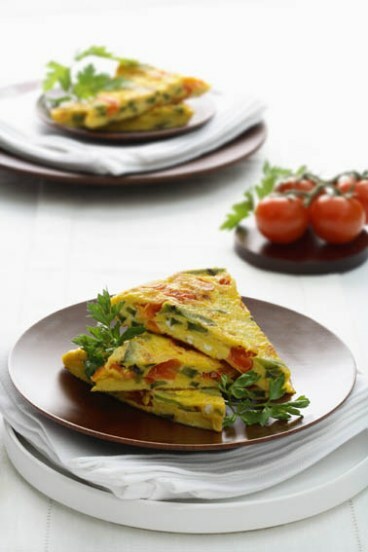 *Many people make this frittata with leeks and spinach together.